Veggie of the week: mung bean sprouts. This bean is primarily cultivated in Asia and prepared in many Asian cuisines. You can eat mung bean in its bean form, and it can also be sprouted, which is the form we’re featuring here. It is often referred to as “bean sprouts.” They are crisp when raw and can be blanched and boiled for a softer texture. I enjoy them in a variety of ways: raw in salads, in sandwiches, in spring rolls, with soup, steamed, blanched, and stir fried. This week, I decided to pickle them. More information on mung bean sprouts. 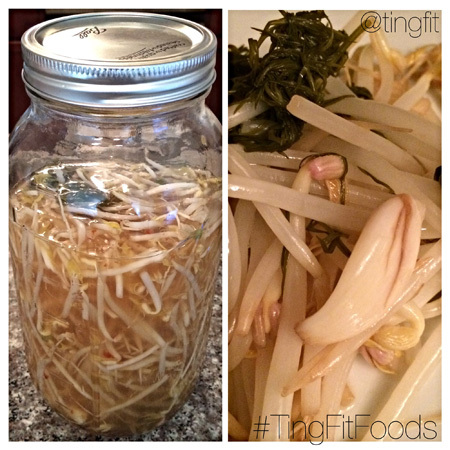 Mung bean sprouts are used in traditional Chinese medicine to detoxify the body, particularly the liver. The liquid of mung bean soup (not sprouted), helps to cure food poisoning and reduces toxicity in the body. It is high in fiber, vitamin C, vitamin K, the B vitamins, copper, and manganese. 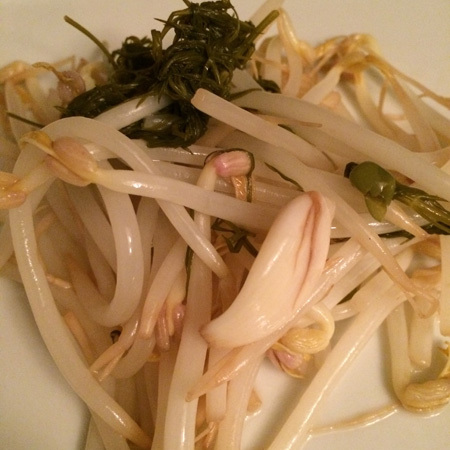 Bean sprouts are commonly eaten all over Asia and is prepared in a variety of dishes. 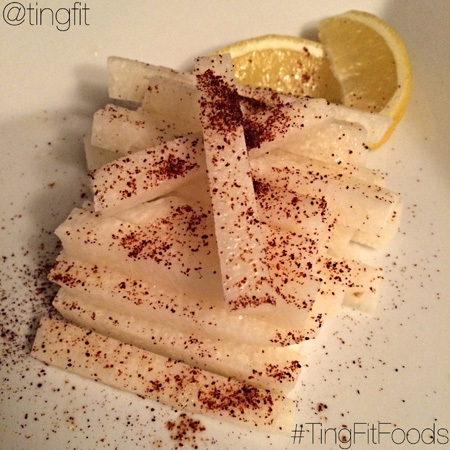 It can be a dish in itself or it can play a complementary role as a side dish or as an added ingredient to an entree. These sprouts are often stir fried with garlic and spring onion, added as an ingredient inside egg rolls and spring rolls, used in soup and noodle soup dishes, and also served as a cold dish prepared with sesame oil, vinegar, chili oil, garlic, salt, and a variety of other ingredients. Bring all ingredients to a boil (except for the water). Once it boils for about 30 seconds, turn off the heat. When cooled, pour the mixture into a mason jar. Add raw mung bean sprouts. Fill the rest of the jar with water. Let sit for 24 hours in the fridge before eating. 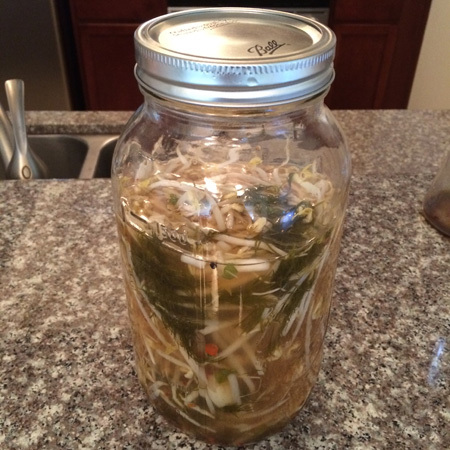 pickled bean sprouts: served chilled and ready to eat!